One by one, human traders - having suffered devastating losses in the past 11 months - are giving up hope on stocks, now that BTFD no longer works. And, in a disturbing development, so are the robots. A $30 billion computer, run by UBS' wealth management which oversees $2.4 trillion in capital and entrusted by some of the world’s richest, is poised to underweight stocks as real money and systematic investors pare risk amid flagging bull-market momentum. According to Andreas Koester, head of global asset allocation at UBS Wealth, the quantitative-investing platform is close to trimming its equity holdings to 20% from a neutral 50%, a shift that would lead to an avalanche of selling as hundreds of billions in stocks are forced to find a new home. The reason why the so-called Systematic Allocation Portfolio is about to move the relative safety of cash and high-quality bonds over growth-sensitive assets, is due to a deteriorating mix of signals from GDP, PMIs, corporate earnings and retail sales. The bearish signals from the data-crunching robot are similar to growing warnings on Wall Street about the global economic trajectory even as other robots in the form of commodity trading adviser quants are forced to lighten up on U.S. stock allocations as volatility picks up, resulting in even more selling. Bearish signals from the data-crunching robot echo fresh warnings on Wall Street about the global economic trajectory while quant peers like commodity trading advisers ease up on U.S. stock allocations. "At the moment, the momentum signal is strongly negative,” Koester told Bloomberg. "While the economy is doing fine, the market is worried about something else, and you can argue that it might be protectionism, oil prices, fear of a recession in 2020." Yet despite robust global data, equities slumped to their worst month in seven years in October battered by trade wars, valuation fears and rising rates. 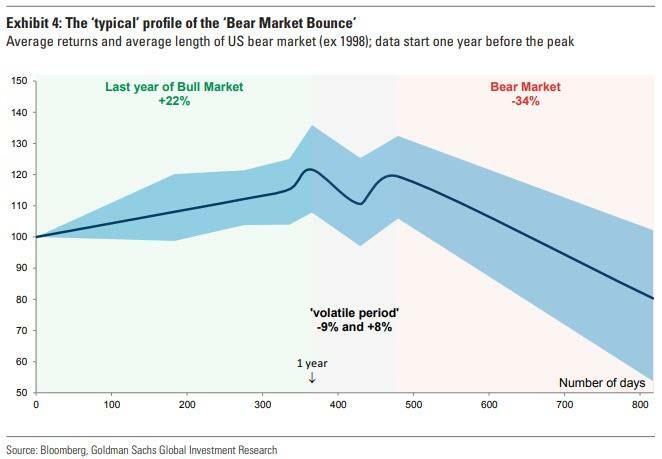 This has led traditionally cheerful investment banks like Goldman Sachs to call for “a sustained period of low returns” across equities and credit, and warning that "stocks may be about to enter a sustained bear market." As Bloomberg notes, the quant strategy which allocates tens of billions for the Swiss bank looks at economic as well as equity and credit indicators to help determine whether to overweight or underweight shares in the MSCI World Index. By design, the bot launched in 2015 isn’t as sensitive as those run by quant investors like CTAs, which respond to hair-trigger moves with breakneck speed. Which is even more troubling, because if this "crude" strategy is about to shift into sell mode, than countless other quants are likely to follow suit. The result could well be a bidless market as the robots pull their bids in the resulting selling waterfall. Making matters worse is that amid rising fears of a robo-puke, is that there will be no human intermediation to stop the algo-precipitated liquidation once it begins: quants like SAP have been in hot-demand from the younger generation of rich investors enamored by big data as a way to extract alpha, said Koester. "We see clients getting a higher affinity for data-based strategies than 20 years ago, when you wanted a wise man with gray hair and a beard to make decisions," said Koester. Of course, if the S&P tumbles 50% over the next 12 months, the last thing clients will ever want again is some vacuum tube dumping their stocks into a bidless market. But lessons are meant to be learned, and the past decade of relentless "market" levitation provided precisely zero investing lessons to the investing community besides "buying the dip." 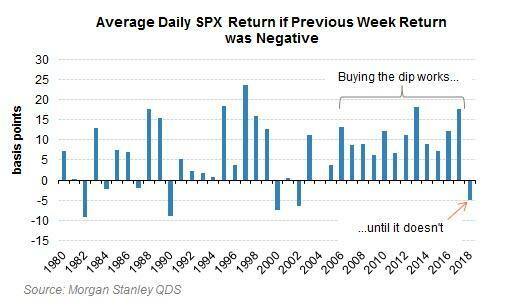 Alas, as Morgan Stanley recently showed, that no longer works, and now machines are flying blind. The UBS robot won't be the first to pull the plug on its bullish strategy: Geneva-based Pictet Wealth Management with $189 billion started pulling money from hedge funds last year in favor of the cheaper factor-investing strategies pursued by quantitative investors.